Incomplete cast copper alloy heraldic shield-shaped mount of Medieval, thirteenth or fourteenth century date (AD 1200 - AD 1400). Length 44mm, width 37mm and 4mm thick. Weight 13.43g. The shield is 22mm in length and 19mm in width. Viewing the mount in plan, it has two integral curving appendages which project outwards from the left hand side. The upper appendage is situated at the upper left hand corner of the shield and the second appendage is situated about two thirds of the way down from the top of the shield. Each of the appendages taper and are D-shaped in cross-section, flat on the underside and terminate with an old break. When complete, these curved features formed part of a frame and they may have had an expanded and perforated terminal to facilitate attachment to another object. Alternatively, the upper part of the frame may have been integral with an upright shaft or stem which would have been attached to another object. The mount has lost most of its original surface. However, beneath small areas of corroded copper alloy deposits some gilding has survived. The shield was embellished with a design incorporating enamel although the form of the design is unclear due to corrosion. The small areas of enamel that have survived are presently red, although the colour may have changed over the course of time due to decay. The rear face is flat and plain. 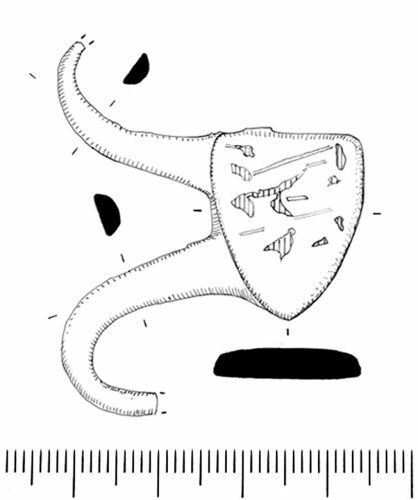 Similar shield-shaped mounts have been published in Finds Research Group Datasheet 12 - 'Shield-Shaped Mounts' (Griffiths 1989, 1-4, figs. 5 and 6). For similar mounts see also: Wilmot 1982, 299-302 and Nelson 1940, 387.